"Could I rent that little house in the back for my family?" Joseph inquired at our door. "We've just moved to Bethlehem from Nazareth." "And how do you plan to pay for it," my husband Jacob retorted. He didn't trust outsiders, you know. Mercy! If we had just known who they were, we'd have given it to them. But no one knew. Not then. Joseph held out his hands. Strong, big hands, callused from hard labor. "I'd work for you. Help with the livestock, harvest in the summer, whatever you need," he said. His eyes were pleading. "I ... we just had a little baby last week...."
"Oh, was that your baby born in the stable behind the inn?" said Jacob. "You know about it?" Joseph was amazed, but continued, "When I can get some carpenter jobs I can pay you cash money." I could see Jacob weakening. He looked at me, and I smiled. "Yeah, you can take it," he said gruffly. "But I'll expect to see you first thing in the morning. We've got wood to cut in the hills." They moved in that afternoon, and Mary and I became fast friends. She reminded me of my own daughter. Two years later about midnight, a caravan lumbered into Bethlehem and halted right in front of our house. Camels were kneeling, riders climbing down from their mounts. Easterners, they were, and rich. There were three of them in all, the rich ones I mean. You don't count servants, I'm told. They were looking beyond us to the little house where Mary and Joseph and Jesus lived. It was bathed in a gentle, ethereal light. I looked up, then and saw the star--I guess that was what it was-- shedding its clear light on the house. 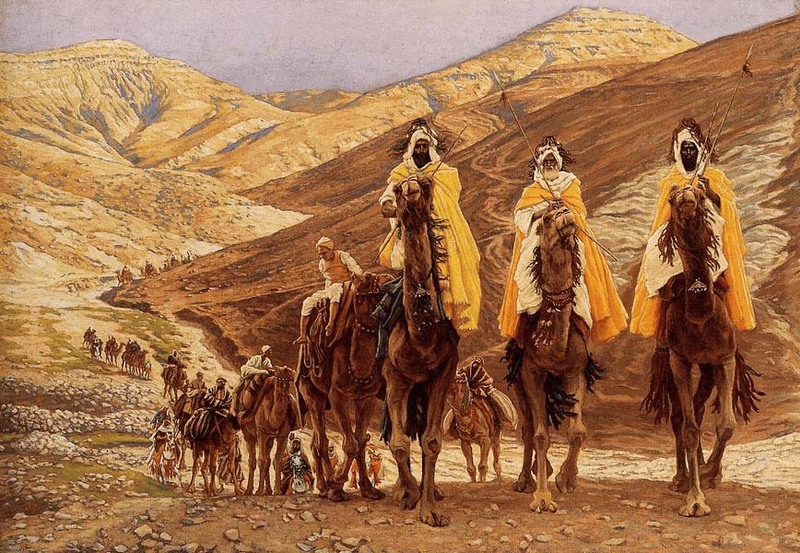 The rich men--Magi you call them--didn't seem afraid. They moved toward the little house, with their retinue of servants behind. Through the open door we could see them kneeling on the dirt floor before the sleeping Jesus. "We saw the child's star in the East. We knew that it meant a great king had been born among the Jews, greater than any on earth," Balthazar was saying. "We came to do homage to such a great king." I could see tears flowing down Mary's cheeks. The man continued. "We went to Jerusalem, but they knew of no baby kings." Jesus, a king? How could it be? The family was so poor, Joseph just a farmer-carpenter, Mary a peasant girl. "We had an audience with King Herod," he went on. "His scholars said the Messiah-king was to be born here, in Bethlehem of Judah. King Herod seemed troubled." He paused, and murmured something to the others in their strange Eastern tongue. You could tell they didn't trust Herod. The Magi motioned for their gifts to be brought in. The first fumbled with the latches on a strongbox, and then pushed up the lid. Gold! Under the light from the flickering lamp coins and ingots sparkled. "For the King," he said simply, and then prostrated himself before the toddler. Little Jesus, beginning to wake up now, just sat there, watching intently. The second visitor opened his chest. Ah ... the fragrance of exotic spices flooded the room. Jesus sniffed and peered into the box, and then the second visitor prostrated himself before the child. Then Balthazar brought the final box containing a fragile alabaster flask. He pulled the stopper and a new smell struck us--heavy and rich, the smell of death--myrrh, used to anoint the bodies of the dead. Strange gift for a toddler, I thought, even a royal one. He replaced the stopper, and then he, too, knelt with his forehead to the ground before the child. Finally, the three excused themselves, and sort of backed out of the tiny room. Joseph reached out to Mary, who took Jesus in her arms. They just sat there, holding each other, trying to understand. Now Balthazar spoke to Jacob. "Could we encamp in your pasture tonight?" Jacob nodded. The man signaled, and the servants began unpacking tents. By now, half the town was standing on the road in front of our house watching, faces lit by sputtering torches. Servants trekked back and forth from the donkeys and camels to the three great pavilions they had set up, carrying all sorts of things. Finally, people drifted off to their homes, but I must confess, I didn't sleep much. Next morning the servants were up early reloading the animals, and finally striking the grand tents. The Magi had been over to Joseph and Mary's house several times to see the child, and then they were gone, camel bells tinkling in the distance. The next night, however, we were awakened by someone beating on our door. It was Joseph. Outside I could see Mary with little Jesus. Joseph was as white as a sheet. "Come in man," said Jacob, "You look like you've seen a ghost." "An angel," Joseph replied. "An angel appeared to me in a dream. He told me, 'Get up, take the child and his mother, and escape, for Herod is going to search for the child to kill him.'" Mary was shaking so I went over and held her. "Jacob," Joseph asked, "may I buy one of your donkeys for the journey?" Joseph removed a single gold coin from the folds of his robe. "That ought to cover it," he said, placing it firmly in Jacob's palm. My husband's eyes lit up, his fingers closed over it, and he was just about to tuck it away when he stopped, and then handed the coin back to Joseph. "No," he said, "I want to give you the donkey, and wish you Godspeed." (I was so proud of Jacob in that moment.) "It's the least we can do," he said, "for you ... and for the Christ-child." I bustled about, heart in my throat, putting together some food for the family, while Jacob and Joseph tied the heavy treasure boxes on Joseph's donkey. Then Joseph helped Mary and the child up onto the other donkey--our donkey--and embraced Jacob. "I don't know how we can thank you for what you have done for us these past couple of years," he was saying. "You've made us feel at home, and now ... and now we must leave you in the night. Thanks." Then he whispered, "You won't tell anyone where we went, will you?" "Where are you going? Back to Nazareth?" "It's best you didn't know," Joseph said, "but we'll see you again. I'm sure we'll see you again." And with that, he led the animals to the road, south towards Egypt. I waved, and little Jesus waved back at me. "Jacob, do you think they'll be all right by themselves with all that treasure?" I asked. He looked at me with a tenderness and wonder I only saw in him now and again. "The God who summoned the Magi and sent the angel is right there with them. They're not alone, Rebecca. How could they be alone?"